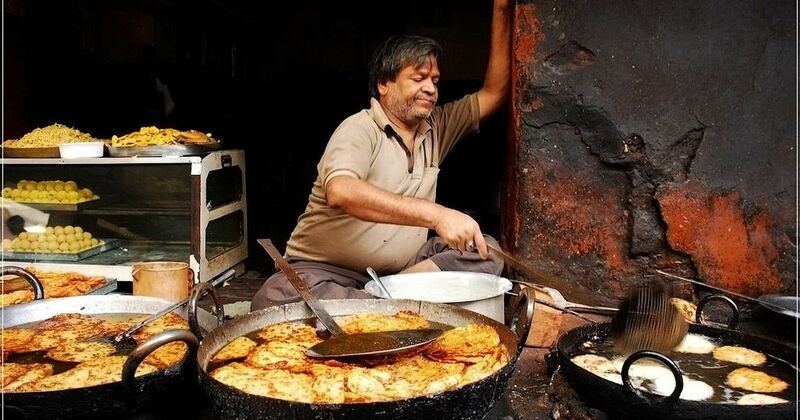 As India becomes more prosperous, the prevalence of diabetes is becoming more common among the middle-class and the poor in affluent cities, finds a new study. Two years ago, 49-year-old Ramachandran, a resident of Kolkata, underwent a regular medical check-up and was told that he was pre-diabetic. Even though he changed his diet to control his blood sugar levels, after a year he found that he was losing weight unusually and that his vision was blurring. In September last year, Ramachandran was diagnosed with type 2 diabetes. Ramachandran is an engineer from a middle-income background. It is among people like Ramachandran that diabetes is on the rise. Diabetes has long been a disease of affluence but small regional studies in recent years have indicated that, in India, it has been slowly spreading among lower income groups. However, an ongoing national survey of diabetes called the Indian Council of Medical Research – India Diabetes or simply ICMR-INDIAB study finds that many more people from middle-income and poor communities are becoming diabetic. 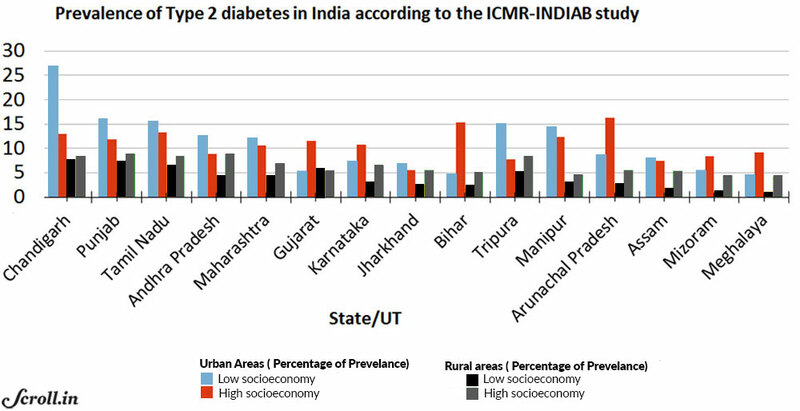 The ICMR-INDIAB study is the largest national representative of diabetes and includes data from more than 57,000 people across 15 states, both in rural and urban areas. 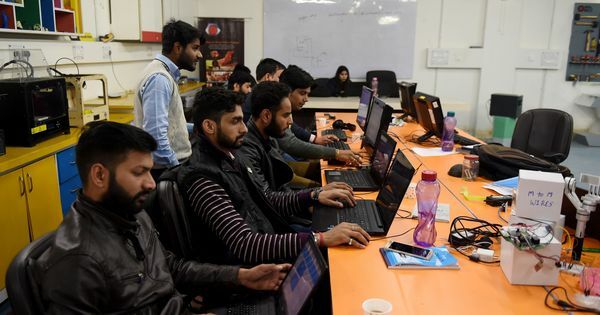 The study represents 363·7 million people or 51% of India’s adult population. Similar previous studies have been only regional with small sample sizes, low response rates and with varied diagnostic criteria. For this study, the researchers considered each person’s bodyweight, height, waist circumference and blood pressure and used glucose tolerance tests to diagnose diabetes and pre-diabetes. “We have also provided the first-ever data on the status of the diabetes epidemic in the North-Eastern states of India,” said Dr RM Anjana, vice-president of the Madras Diabetes Research Foundation and the lead author of the study published on Wednesday in the journal The Lancet Diabetes & Endocrinology. The overall prevalence of diabetes across the 15 states studied was 7.3%. The rates varied between states, from 4.3% in Bihar to 13.6% in Chandigarh. The overall prevalence of pre-diabetes was 10.3% as per the criteria set by the World Health Organisation. Men were more likely to be diabetic than women. Almost half of the people enrolled in the study were previously undiagnosed and were thus not aware of their diabetes until they were tested. On an average, the researchers found diabetes to be twice as common in urban areas at 11.2% compared to the rural areas at 5.2%. However, in the urban areas of more economically advanced states, diabetes was higher among people even from low socio-economic backgrounds – a transition that is already common in high-income countries. The study suggests that the age of onset is in the age group of 25-34 years, which is at least two decades earlier than in developed countries. People living in urban areas have access to diabetes care services and can afford the associated out-of-pocket expenditure. However, people living in semi-urban and rural areas do not have access to diabetes centres or clinics that provide comprehensive care. Given that people in rural areas and poorer communities in cities are unable to access care earlier, they would be more prone to advanced complications such as renal failure and blindness due to retinopathy. According to Anjana, the changing lifestyle of people even among the middle-class and the poor in big cities like Kolkata might be the reason for this demographic shift in the diabetes epidemic. Kerala, the state with the highest reported prevalence of diabetes in India so far, has recently imposed a fat-tax. Countries like the United Kingdom are imposing sugar taxes on sweetened food and beverages. Can such taxes help reverse the diabetes epidemic in India? Minimising television and screen time, giving breaks to sedentary behavior, using the stairs instead of an elevator, eating more fruits and vegetables, and cutting down junk-food all go a long way in preventing diabetes. Anjana also recommends that central and state governments make policy changes and investments to control the burden of non-communicable diseases like diabetes. These measures include ensuring the supply of nutritious food and creating public spaces for people to exercise. The National Program for Control of Diabetes, Cardiovascular Disease and Stroke, which has been rolled out across the country, could also help improve diabetes awareness levels at a national level. Dr Thaksaphon Thamarangsi, director of the department of noncommunicable diseases and environmental health at the WHO regional office in New Delhi said that no single policy or intervention can ensure prevention of non-communicable diseases including diabetes. “It calls for a whole-of-government and whole-of-society approach, in which all sectors systematically consider the health impact of policies in trade, agriculture, finance transport, education and urban planning,” he said. Diabetes and its complications cause substantial economic loss to the patients, their families, and to health systems and national economies through direct medical costs and loss of work and wages. “The fight to curb or control diabetes must continue,” said Thamarangsi. The ICMR-NDIAB study will continue to gather diabetes information from remaining states and overall data for India might be available within a few years, said Anjana.